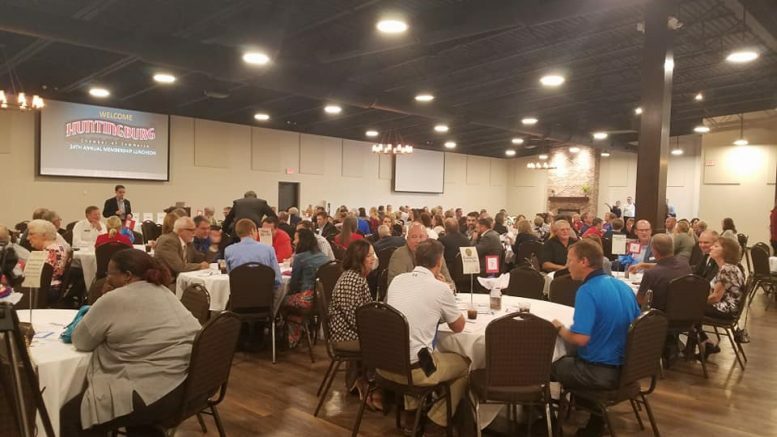 Tables filled at Venue 1408 Thursday for the Huntingburg Chamber of Commerce Annual Meeting, Business and Community leaders gathered to review the year, network, and celebrate in anticipation of the naming of this year’s award recipients. Sara Schroeder, Executive Director of the Huntingburg Chamber, discussed the year in review. Membership sits at 130 for 2018,a drop of 4 from 2017. Schroeder attributes this to a few businesses closing, but says the Chamber remains optimistic as several new businesses are coming in to the local area. She highlighted events from the year such as Garden gate, the Colts fan fest, and the Dubois County Bicentennial Block Party that was hosted downtown on 4th street. She also listed accomplishments, such as partnering with the Ferdinand Chamber for regular networking breakfasts, their successful “Start Your Business Your Way” series, and the Chamber 19, a newsletter publication to streamline chamber communication. Three awards were presented this year. The Golden Leaf Award recognizes a business that went above and beyond to service the best interests of Huntingburg. This years recipients were Chuck and Jean Walk, Owners of Fat & Sassy. The Walks stated they consider this a family award. The Next Generation of Leadership award recognizes an emerging leader who demonstrates focus and drive in both their professional and personal life. The 2018 Next Generation of Leadership Award was presented to Emily Meyer, owner of the Art Factory on 4th Street. Emily Meyer plays a vital role in downtown events, and is stated to always be the 1st to volunteer and the last one cleaning up at the end. Finally, Business of the Year was presented to Touch of Class for outstanding business growth and values. Touch of Class is celebrating over 40 years in Huntingburg. The feature speaker wrapped up the event sharing lesser known stories about Dubois County and the surrounding area.This year’s speaker was Dubois County native Lee Bilderback. He told of the wilderness that once covered the area, mentioning that 190 foot yellow poplars once stood where the crowd was seated. He also touched on pioneers moving across the land along Buffalo trace, Portersville’s history as a major crossroads, and the development of the Dubois County known today. Be the first to comment on "HUNTINGBURG CHAMBER NAMES 2018 AWARD RECIPIENTS"